I feel like I�m on the set of a Sting music video. Draped over the edge of Villa Su�s 15-metre-long infinity-edged pool, I�m enthralled by the constantly changing colours of the Mediterranean. Below me, a steep stone staircase leads to a secluded deck with our own private patch of sea, where the water is a kind of translucent aquamarine. In the distance, where the Greek Island of Meis and several smaller Turkish isles complete the skyline, the sea is a deep sapphire-blue. We arrive at Villa Su after an incredibly beautiful two-hour drive (which is uncannily reminiscent of the Southern Cape�s famed Garden Route) from Dalaman Airport to Kas. Perched on a steep hillside, our home-away-from-home is the ultimate in minimalist chic. A giant front door, flanked by bougainvillea, opens onto a cool, white-marble-floored landing where the South African owner�s contemporary artworks adorn the walls. The all-white palette extends to the three en-suite double bedrooms and is broken occasionally by the earthy tones of the odd African artefact: a carved wooden stool here, a Masai-fabric wall hanging there. Floor-to-ceiling lilac mosaic tiles in the shower add interest to the modern, all-white bathrooms. Though there�s air-conditioning in every room, the white marble throughout helps to keep the house cool - temperatures in Kas get up to 40C during July and August. A spiral, metal staircase leads to the lower-ground floor � the spacious and airy open-plan living-dining-and-kitchen area, where two oversized sofas have pride of place in a sun-drenched, sea-facing nook. Behind it, a double-sided hanging fireplace acts as an informal room divider. In the other sea-facing corner, an eight-seater dining table leads through floor-to-ceiling French doors onto the pool deck; the granite-and-stainless-steel kitchen complete with all the mod cons (including an espresso machine! ), adjoins the dining area on the other side. And then there�s the pool terrace� with its infinity-edged pool that seems to flow straight into the sea, an ocean-facing entertainment area (perfect for long lunches and late-night parties) and a bougainvillea-covered outdoor shower with breathtaking views of the mountain and sea. The overriding sense of seclusion and space is soporific, I�m loathe to sink into a chaise-longue for fear that I�ll never get up again! The 10-minute drive into town, along a twisting, half-completed road, has spectacular views of Kas�s 500-metre-high mountain and harbour. Most of the traffic lights don�t work, but the attitude of local drivers is so laid-back, that traffic flows smoothly. Town life centres around the cosy harbour. The main precinct is a tree-lined, sea-facing cobbled street dotted with park benches where old men fidget with their worry beads while staring out to sea. Children whizz by on bicycles, waving to their parents at the nearby tea gardens. Come sunset, you�ll find lovers strolling towards the landmark lighthouse, while the local fisherman head back to shore with their catch in tow. The vibe is absurdly chilled. At night Kas is buzzing; it�s almost as if the day�s lethargy is washed away by the tide. The winding cobble streets teem with glitzy shoppers while restaurants prepare for the evening trade. Ma�tre d�s stand on the pavement of the restaurant-lined Ibrahim Serin Caddesi, soliciting passersby with their (rather unconventional) sales pitches. One guy rushed inside and reappeared with a large stainless-steel platter of raw bream, barbel and sea bass in order to prove the just-caught freshness of his fish. If anything, it had the reverse effect - my partner Adam goes cold at the sight of a whole cooked fish, let alone a still-wriggling raw one! 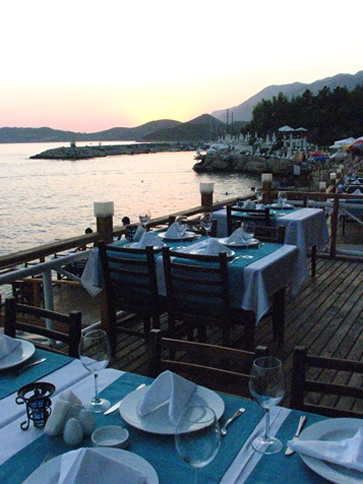 Restaurants in Kas are not about stylish d�cor or silver service, they�re about breathtaking locations and stunning views. And, you can be sure that just about anywhere you eat, the food will be excellent � simply because the Turks have particularly high culinary standards. We arrived at Nur Beach Restaurant (+90 242 836 4360, Likya Caddesi) in time to watch the spectacular sunset from our cliffside table. Our meal � I had the grilled calamari strips and Adam, the lamb shank � was utterly delicious. With chilled house beats in the background and the sound of crashing waves below us, we could have sat there forever. Set in a beautiful garden with lanterns dangling from the trees, Bahce Restaurant (+90 242 836 2779; Dogruyol Caddesi) sits above street level so you can people-watch while you eat. The palette is all white � from the tablecloths and napkins to the waiters uniforms� � and the service excellent. Choose your starters from an oversized tray of delicious meze, but leave enough room for the grilled sea bass on a bed of red onions, tomato and rocket � sublime. 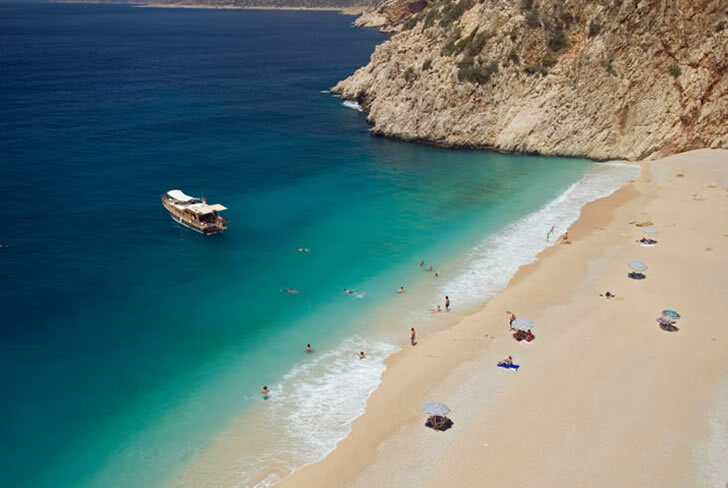 If you�re not after a beach day, but feel like a quick dip, B�y�k Cakil � like most beaches in Kas � is small and pebbly but the water is heavenly. Then there�s Kaputas, 20km west of Kas, where a small highway bridge leads down a steep staircase to a picture-perfect sandy cove. Looking at the dreamy turquoise water from the bridge is one thing; diving into it is quite another. Like plunging into paradise, the Mediterranean is silky and comforting, refreshing and invigorating all at once and is, without a doubt, the highlight of holidaying in Turkey. 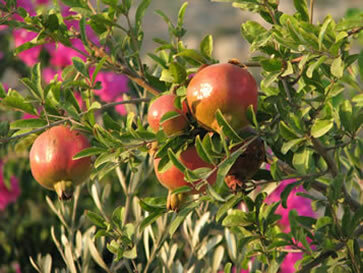 Formerly known as Antiphellos, Kas dates back to ancient Lycia � the area extending from Dalaman to Antalya. The most obvious reminders of this ancient civilisation are the monumental sarcophagi and rock-cut tombs littering the hillsides in and around Kas, as well as an amphitheatre about 500 metres to the left of the main square. At the intersection of Uzun �arsi Caddesi and Suleyman Sandikli Sk � right in the heart of Kas�s main shopping and restaurant hub � is a Lycian sarcophagus under the shade of an old tree. Out of its base, a seat has been carved and someone�s put a cushion on it, making it the ideal place to catch your breath before heading off for the next bout of shopping. The shops stay open until midnight and, though they�re open from around 9 in the morning, the best time to shop is after sunset, when the heat has abated. From gorgeous fabric to antique books and maps, jewellery and fashion, there are shops to suit all types. For groceries, toiletries and fresh fruit, head to Migros, the Turkish supermarket chain. For bargains, intrepid shoppers should try the local market (on the right-hand side of Atat�rk Boulevard, driving towards Antalya). Here you�ll find everything from underwear to okra and knock-offs of big-name brands. There�s not a tourist in sight and no-one speaks English, so be prepared for purchasing in sign language. Given the choice of staying in a hotel or luxury villa, I�d choose the villa time and again for the sense of space and assured privacy. Also, when you�re shopping for your groceries and filling your hire-car with petrol, you get a sense of 'living' in a community � which is different to a tourist experience. The flight from Istanbul to Dalaman takes around one hour and 20 minutes and the drive from Dalaman to Kas an additional two hours. If you book your stay through Elixir Holidays, all airport-hotel transfers are taken care of and you�ll be transported in the luxury of an air-conditioned car, complete with plasma screen and minibar. Hire a car � Villa Su is 10 minutes out of town. Petrol costs 3,40YTL a litre. Weather-wise, the best time to visit is in September � July and August are too hot.